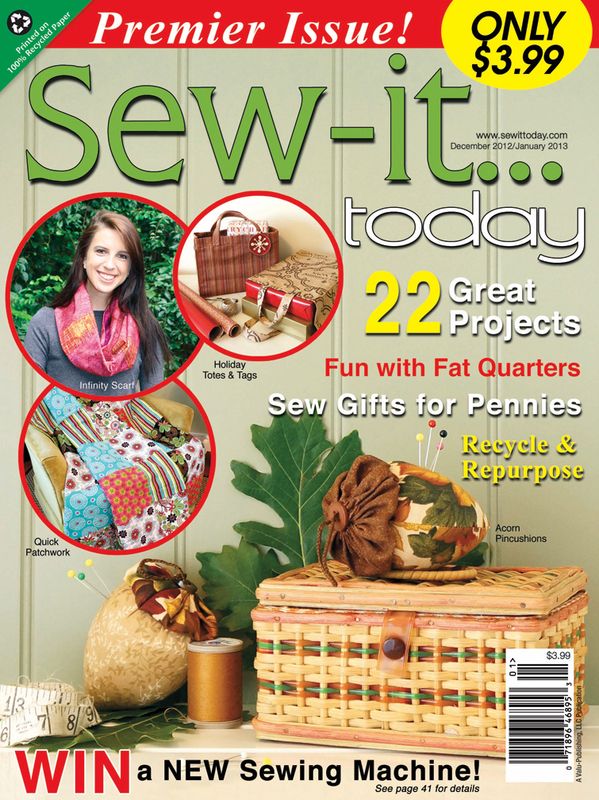 Premier Issue of Sew-it... today! This issue has mostly sewing projects with a few quilts. With a price point of $3.99 and 22 projects it is a great value. Don't worry, if you cannot find it at the big box or sewing/craft stores near you go to www.sewittoday.com and get your issue or subscribe online. Here is a peak at some of the projects you will find inside. Birds of a feather, definitely do flock together! In 1992, when my oldest boy was five years old, he spent a week at my parents house all by himself. My parents have always been very crafty and constantly making and fixing things. The original do-it-yourselfers. Well, my Dad wanted to involve my son in a project while he was visiting so he came up with the idea to make a sewing bird based on a sewing bird he had made for his mother when he was an adolescent. It was going to be my son's present to me when he returned back home. I was thrilled with my sewing bird present, the whole back story of the sewing caddy and the fact that my son and parents all took part in creating it makes this sewing bird the prize of my small collection. I had never seen sewing caddy's like this before but instantly fell in love with the charming, folksy sewing bird my Dad made for me. After that, anytime I went to garage sales or antique shops I was always on the look out for other examples of sewing birds. Over the years I have found more sewing birds, each one just a little different from the next. Most look hand-made and hand-painted. I know I could find more on-line to add to my collection but I would rather just find them in my travels and hunts then go about acquiring them the easy way. This way each one has a story and I usually find them at a very reasonable price. I have a small collection of just eight birds but love them all, even with their flaws. There is just something about an item used for utility but designed beyond necessity with charm that makes these sewing birds so dear to me. I think of the other women who owned these before me and possibly had a son make or give it to her as a gift. My newest sewing bird to my collection was given to me by a friend for my birthday. Isn't this the sweetest thing?!? I love it! 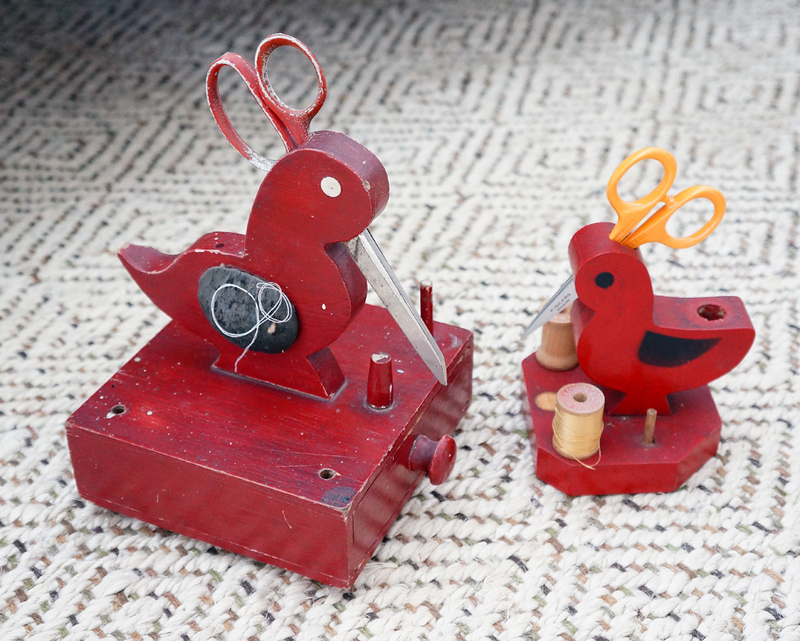 These red sewing birds, although not in the greatest condition are a cute pair. One has a drawer and one is just on a block base. The small one would have had a fabric pincushion on the tail and a peg for a thimble at the front. These are neat, the wood is left natural. The small sewing bird is a souvenir from Mercer, Wisc. ("Loon Capital of the World") and the large one seems homemade with a hand-carved bird or duck, not sure where or when it may have been made. 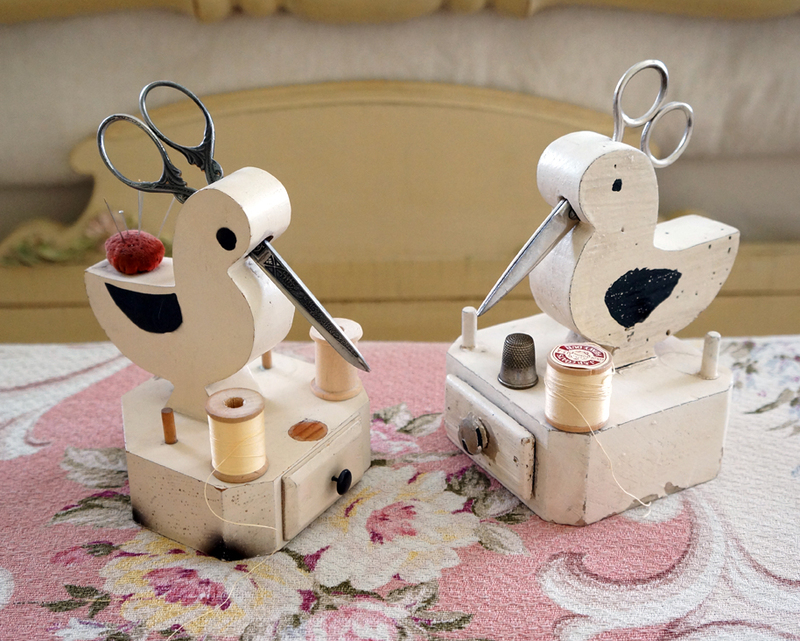 These two white painted sewing birds are the last of my small collection. They are very similar but do vary slightly, more then likely of the same era - my guess is 20-'s-30's vintage. 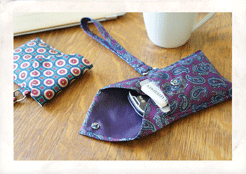 It is fun to collect vintage sewing items that can be used as well as admired. I wanted to say, thank you to the wonderful and encouraging comments about our Quilt-it... today magazine! Deb Hearn (former Editor of QUILT magazine) and I have been working our tails off and pretty soon you will be able to see our hard work. Your comments made me realize I never gave the information about subscriptions for the magazines. To answer your questions, yes, there are subscriptions available. To subscribe to Quilt-it... today, you'll get 6 issues for $12.95 (Canada is $18.95). These prices have the S/H already included. We are still working on the web site, it is very, very rough right now but should be up and running and looking pretty in a week, you can visit www.quiltittoday.com for more information. Thanks for your wonderful support! Even though I have the advanced copies already you bet I am going to go into the stores just to see it on the shelves! You will want to check it out too, there are lots of nice projects for beginners and intermediate sewers. The Quilt-it... today issue is mostly quilts with a few sewing projects. 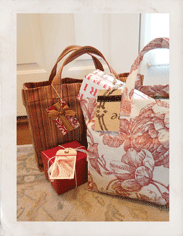 In there I have designed a quilt--Weekend Picnic, a sewing project-- On-the-Go Tote, and a quick notions project--Sugar & Spice that I know you will love. The magazine has 16 projects and is a wonderful value for just $3.99! Take a look and let me know what you think of it.